Legwarmers! Legwarmers come in different colors, lengths, and fabrics! Leg warmers are extremely versatile. They come in classic colors such as pink, black, and white, that will fit into your school’s dress code. They also come in fun colors and patterns. You can find them at your local dance wear store, and on your favorite dance wear website. Legwarmers keep your ankles and calves warm during those first few plies and tendus. during the first plie. All of a sudden starting contemporary with a floor warm up sounds torturous! Today we’re going to highlight some fashionable and fun cold weather dance accessories to keep you warm in those first few minutes in class. Fitted sweaters! Many dance wear stores sell sweaters specifically made for dancers. They are fitted, so they will not compromise your line and come in classic colors so you don’t have to worry about dress code. There are a variety of styles of sweaters, some that crop right under the bust and others that wrap around the body. 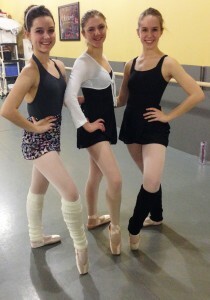 If you can’t find a sweater at your favorite dance store, really any fitted sweater will do. No dancer wants to get caught wearing a baggy fleece during warm up, and your teachers want to be able to see your alignment. Three – quarter or long sleeve leotards. Three quarter sleeve leotards look sophisticated and create nice lines. Three quarter sleeve leotards now come in beautiful styles, some with mesh or lace, and others with a lower back. Check them out online or at your favorite store! Don’t get caught shivering through warm up! Spruce up your dance wardrobe with your favorite cold weather accessories. Sparkly ballet wrap sweater. Available at Atlanta Dance Central! Thanks! Our website was made by En Pointe Designs!